© 2012 by The York Daily Record/Sunday News. 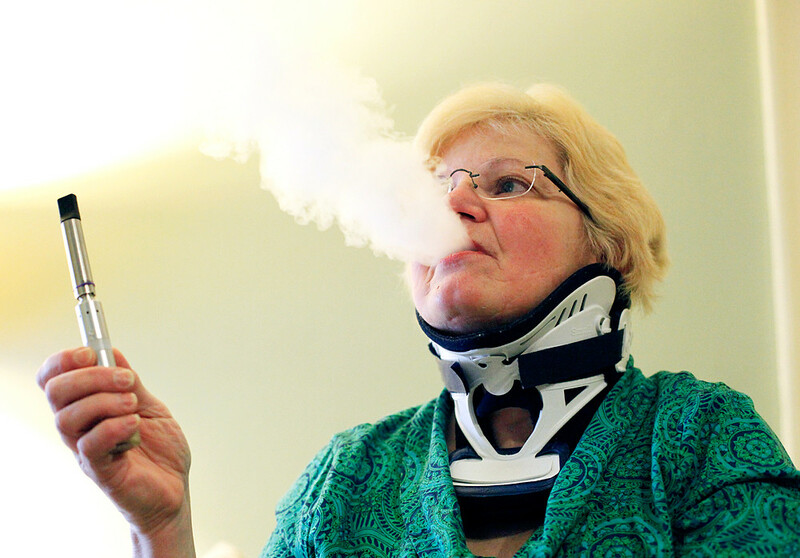 Sharon Luers of Shrewsbury exhales while demonstrating a particular model of electronic cigarette in her home on Thursday, Jan. 5, 2012. Luers is an organizer for the White Rose Vapers Club, a group of about 50 people in the York area who smoke electronic cigarettes. Luers herself has a sizeable collection of electronic cigarettes and e-liquids, the use of which she encourages as a way to stop smoking actual cigarettes. The “smoky…/Hazy” your referring to is the vapor exhaled after taking a drag from my e-cig which I am holding in my hand. By the way, my electronic cigarette (e-cig) is a AV Pulse Pearl (http://www.vaprlife.com/The-Pearl-AV_p_12.htm) . The cartomizer (what heats the e-liquid) is a eGo Mega Dual Coil Cartomizer with a rubber whistle tip (the black thing on the top). The following is a YouTube video explaining the Pearl and the reviewer shows inhaling and exhaling.